Stella Cherries: the before picture; the after, no so pretty. Metaphors come in all shapes and sizes (as do cliches), and this morning one of my favorites came to mind and to rest at my breakfast table. 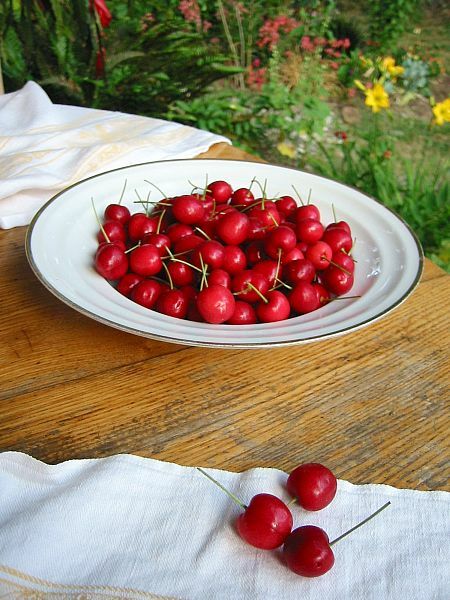 Life is just a bowl of cherries indeed. And with such a glowing cache of fresh-picked gems before me, the world seems pretty fine. Mr. Ray Henderson’s 1931 classic sums it up quite nicely; words to live by, just keep an eye out for the robins. To take my plunge ’round the Empire State. Life is just a bowl of . . . aw, nuts! So live and laugh at it all!